There are nine new wines on the Top 50 this month as a result of recently tasted wines, new additions to the LCBO’s selection and new vintages of existing listings. The Top 50 list features the wines commonly referred to as General List and Vintages Essentials. I constantly taste the wines at the LCBO to keep this report up to date. You can easily find my Top 50 Value Wines from the WineAlign main menu. Click on Wine => Top 50 Value Wines to be taken directly to the list. To be included in the Top 50 for value a wine must be inexpensive while also having a high score, indicating high quality. We use a mathematical model to make the Top 50 selections from the wines in our database. Every wine is linked to WineAlign where you can read more, discover pricing discounts, check out inventory and compile lists for shopping at your favourite store. Never again should you be faced with a store full of wine with little idea of what to pick for best value.In addition to the great value wines below, please check out the links to our new video series. I’m excited to be part of this series and we’ll be releasing new episodes through-out the summer. I have recently tasted many new vintages of wines and some new listings which resulted in nine wines joining my Top 50 list. Every month about 100 products at the LCBO go on sale for four weeks. As a consequence of this temporary price reduction, five wines have joined the Top 50. I am pleased that, for the first time ever, a wine from Greece is in the Top 50. Boutari 2010 Moschofilero from Mantinia in the Peloponnese. I will be leading a group of wine lovers from Ontario there in a few weeks time and I look forward to congratulating the winemaker on this achievement in Ontario. Moschofilero is deservedly becoming Greece’s signature aromatic white and this is a great value ambassador with its orange blossom, apricot, peach and pear aromas. The palate is rich and creamy, yet it is soft well balanced and flavourful with the orangey acidity becoming more evident on the finish. Very good length. Try with mildly spicy Asian cuisine. Graham’s 2005 Late Bottled Vintage Port has a beautiful fragrant nose of blueberry jam, licorice, pine, and dark chocolate. It’s full-bodied velvety smooth, with a soft, creamy texture yet light on the palate despite the considerable alcohol. Very good to excellent length. Shingleback 2009 Haycutters Sauvignon Blanc Semillon is a recent arrival at the LCBO. It is a classic Bordeaux white blend with subtle oak and fresh hay, apple, green olive and beeswax aromas. It is silky smooth with the lively fruit well supported by racy acidity. Very good to excellent length. A lot of complexity and a beautiful texture will make you come back for more. Try with roasted poultry or sauteed veal. Pelee Island 2009 Cabernet Franc is an excellent well priced Ontario cabernet franc, midweight and lively with the bright fruit well balanced by mature tannin and lemony acidity. The nose shows some delicate raspberry and cherry fruit aromas with some earthy and jammy tones. It is very vibrant on the palate; it almost has an Italian feel, with the berry fruit persisting well on the finish. Try with rack of lamb or juicy sausages. Very good length. Santa Carolina 2009 Merlot Reserva has lots of flavour and complexity for a wine at this price. It is a deep purple red with lifted plum and raspberry fruit aromas with mild oak spice vanilla and chocolate notes. It is full bodied with great balancing acidity which keeps the palate light and modest ripe tannin. Very good length. Try roast meats or game. You have until September 11th to take advantage of the lower prices. I spent the last three weeks in Chile and Argentina visiting wineries and exploring the new regions that are being established to produce the many new high quality wines that are arriving in Ontario. Great value wines first started arriving in our stores from Chile in the late 80s. The best were undoubtedly from cabernet sauvignon mostly from the Maipo Valley close to Santiago. This historical region was established in the 19th century. Other varieties came to us from the Central Valley, but the same quality was not evident, however they sold well because they were cheap. Recently vineyards have been established in new locations, quality and value have soared and other grape varieties are joining cabernet sauvignon in the top value category. Carmenere and sauvignon blanc are the two which seem to be doing the best but chardonnay, pinot noir, syrah and merlot are not far behind. Carmenere is one of the red grapes that can be part of a Bordeaux blend, but very little is used in French wines these days. The grape is widely planted in Chile where until 10 years ago most vines were thought to be merlot, indeed it is only in the last 5 years or so that wineries have learnt how to make good wine from this late ripening variety. Amazingly several wineries top red is now made from carmenere. Quite a turn around for a grape that I once thought would never make good wine. There are three wines in my current Top 50 made from this grape. P K N T Carmenere 2010 is a recent newcomer to the LCBO. It is a vibrant well balanced red with good varietal character. Expect earthy black cherry fruit with some warm spicy and tobacco notes. The palate is super smooth and full bodied with supple juicy fruit not at all spicy as might be suggested by the label. It is clean and fresh with very good length. Try with mildly spicy bbq meats. Casillero Del Diablo Carmenere 2010 is the best value among the Casillero reds. It is quite complex for a wine at this price point. The nose is very harmonious with red cherry, plum and raspberry fruit plus well integrated oak spice with dark chocolate, cranberry jelly and mocha notes. The palate is well balanced midweight and quite elegant with good focus and very good length. Try with roast lamb or beef. Santa Carolina 2009 Carmenere Reserva is a well made juicy carmenere. The greeness often associated with this grape is well tamed. The lifted nose is blackberry fruit with dark chocolate and soft spice with a nice touch of vanilla.. The palate is juicy midweight and lively and the finish shows modest tannin and lots of juicy fruit. Very good length. Try with bbq and roast red meats, casseroles or mature hard cheese. In the last five years we have started to see sauvignon blanc wines from Chile’s cooler coastal regions in our market. In the past most wines made from this grape came from the warmer Central Valley where sauvignon vert was also often included in the wine to detrimental effect. I have just spent a few days exploring the Leyda Valley and the San Antonio coastal wine region as well as Casablanca. Here you can smell the sea and sauvignon blanc is making great wines. Four of which are in the current Top 50. The Errazuriz 2010 Sauvignon Blanc shows nicely lifted sauvignon aromatics of hay, lemon, green apple and melon. It is elegant creamy and well balanced with very good length. Try with sautéed scallops with a lemongrass dressing. Santa Carolina 2010 Sauvignon Blanc from the cool Leyda valley is an improvement over previous vintages. It is a very well made sauvignon with aromas of gooseberry, green apple fruit with hay and dried herbs. The palate is firm and flavourful with lots of fruit well supported by acidity driving through to a long finish. Very good length. J. Bouchon 2010 Sauvignon Blanc is a fresh ripe sauvignon that will work well with seafood and mild white meats. This is a very ripe style of sauvignon with aromas of lemon citrus and white peach fruit with hay notes. It is very rich on the palate with lots of peach, melon and pear flavour and some tangerine notes. The finish is dry and lingering with a lot of fruit sweetness. Montes 2010 Classic Series Sauvignon Blanc has a nose that shows gooseberry, lemon, white peach and hay aromas with some mineral, dill and celery notes. The palate is racy, rich, thick with fruit yet well balanced and finishes firmly with a nice touch of celery. Very good length. Try with creamy pasta sauces or herbed chicken. 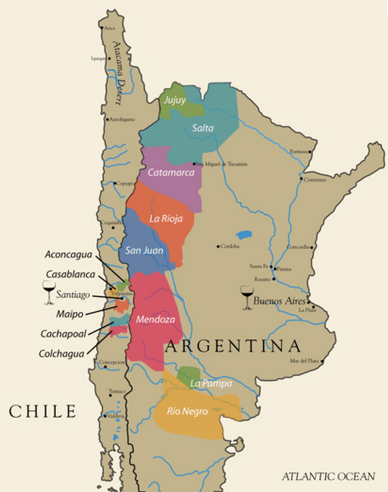 It was in 2006 that large numbers of wines from Argentina started appearing on LCBO shelves, mostly made from malbec; the current darling red grape. There are 21 malbecs for less than $15 at the LCBO and three make it onto the current Top 50. However Argentina is not just malbec and I sampled many good wines from other grapes during the last two weeks when I was travelling in Argentina. For me, the most exciting finds were cabernet sauvignon, unfortunately so few are available here. However syrah/shiraz is also doing well, especially from the San Juan wine region two hours drive to the north of Mendoza. There are three wines from this grape in the current Top 50. Trivento Tribu Syrah 2010 offers a lot of flavour for a wine at its price. It shows ripe fruit yet is balanced by soft tannin and juicy acidity and has very good length with the fruit persisting well. The nose is a bit slender with some blackberry fruit with tobacco notes. Try with meaty pasta sauces, pizza or bbq meats. Graffigna 2008 Centenario Shiraz Reserva shows fragrant aromas of blackberry fruit with dark chocolate and herbal and spicy complexity. It is understated with an elegant balanced palate and very good length. Still youthful with a long lingering finish. Try with duck breast with a savoury cassis sauce. La Puerta 2010 Syrah has its name changed from shiraz in 2009 to syrah with this the 2010 vintage, yet the wine is very similar. It is fresh lively and juicy with the fruit well balanced by soft tannin and good acidity. The nose shows aromas of black cherry fruit with smoke and black pepper spice. It is full bodied but not heavy with the ripe fruit toned by some earthy character. Try with bbq meats. Please click here for a complete list of the Top 50 Value Wines at your local LCBO. The Top 50 changes all the time, so remember to check before shopping. I will be back next month with more news on value arrivals to Essentials and the LCBO.